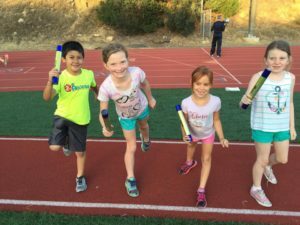 The San Diego Track Club youth running program is offered by the nonprofit organization 2nd Recess ( http://www.2ndrecess.org). 2nd Recess is a proud partner with the San Diego Track Club and would like to thank their organization for the continued support of youth running, health, and wellness in San Diego. 2nd Recess is a youth 501(c)(3) nonprofit organization that inspires young athletes and their families to lead active and healthy lives by introducing them to fun and fitness through running. Our program promotes fitness, teamwork, and health education by utilizing our 3 PÕs of success – Patience, Perseverance, and Positivity. Our dedicated volunteer staff of local competitive and professional athletes instill their passion and enthusiasm for the sport into the next generation of superstars! All one-hour practices are led by our team of dedicated volunteer coaches who have experience as professional runners, marathon finishers, and collegiate competitors. A typical practice includes a dynamic warm up, fun run-based activities, and a cool down. Each practice ends with an inspirational topic and healthy snack. 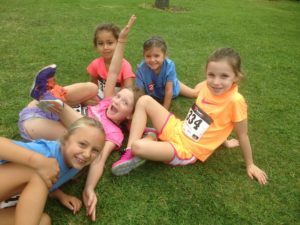 Your children will come away from 2nd Recess with a basic understanding of healthy exercise habits, nutrition, and a new sense of curiosity for the sport of running. We look forward to getting to know you and your child over the course of the season! 2nd Recess is held on Tuesday evenings alongside the San Diego Track Club adult training group. 2nd Recess holds three (3) twelve (12) week seasons a year. Seasons run from February-April, June-August, and October-December. Families are welcome to join at any point during a season. For more information about practice locations and times please visit our website. All athletes will receive a 2nd Recess practice shirt and water bottle so they can sweat in style! A good pair of running/athletic shoes. A jacket for before and after practice. It also helps practice run smoothly if athletes take a bathroom break prior to the start of practice. Thank you for your cooperation! Kids are welcome to try out a 2nd Recess running practice to see if it is a good fit! We ask that parents please fill out all registration forms (registration, medical and waiver forms) even before a trial practice to ensure that we have all of the necessary liability forms. Registration can be viewed and filled out online on our website.